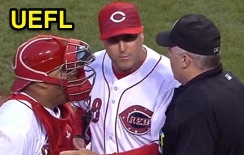 HP Umpire Bill Welke ejected Reds C Brayan Pena for arguing a Replay Review decision that affirmed 3B Umpire Tony Randazzo's safe call in the top of the 5th inning of the Brewers-Reds game. With one out and one on, Brewers baserunner R2 Ryan Braun attempted to steal third off Reds catcher Pena, who threw to third baseman Todd Frazier as Braun slid into third base, ruled safe by Randazzo. Upon Replay Review as the result of a challenge by Reds Manager Bryan Price, Randazzo's ruling was affirmed, the call was irrecusable. At the time of the ejection, the Brewers were leading, 2-1. The Brewers ultimately won the contest, 7-3. This is Bill Welke (52)'s second ejection of 2015. Bill Welke now has 2 points in the UEFL Standings (0 Previous + 2 MLB + 0 Irrecusable-Crewmate = 2). Crew Chief Bill Welke now has 1 point in Crew Division (0 Previous + 1 Irrecusable Call = 1). This is the 115th ejection of the 2015 MLB Regular Season. This is the 53rd player ejection of 2015. Prior to ejection, Pena was 1-2 in the contest. This is the Reds' 5th ejection of 2015, 1st in the NL Central (CIN 5; CHC, MIL 3; PIT, STL 2). This is Brayan Pena's first ejection since August 17, 2013 (Mike Muchlinski; QOC = U [DiMuro]). This is Bill Welke's first ejection since April 27, 2015 (Jonny Gomes; QOC = U [Warnings]).